Morena Y Clara-No Llores Más. As 1973 dawned, a new Spanish flamenco-pop duo Morena y Clara, were about to make their debut at the now legendary tablao restaurant Caripen in Madrid. This was where just Los Grecas had been discovered just a few months previously by producer José Luis de Carlos and were signed to CBS by the time Morena Y Clara took to the stage at Caripen. Little did the two members of Morena y Clara realise that they and Los Grecas would go on to enjoy a friendly rivalry as they became two of the most successful Spanish female duos between 1974 and 1978. The story started when two sisters from Madrid, in Spain, Ana María Muñoz Hernández and Carmen Muñoz Hernández decided to form a new vocal duo together. Ana María Muñoz Hernández dawned the moniker Morena, which translates as brunette, while Carmen Muñoz Hernández became Clara, which translates as blond. With that Morena y Clara was born, and not long after that, they made their debut at the tablao restaurant Caripen in Madrid. Later in 1973, Morena y Clara made their recording debut, when they were invited by their cousin Juan Antonio Jiménez to add backing vocals on Los Chicos debut single Ni Más Ni Menos. Juan Antonio Jiménez was in the process of establishing himself as a songwriter, and Ni Más Ni Menos which was released by Philips later in 1973 his latest song. However, over next few years, Juan Antonio Jiménez would become one of Spain’s most successful songwriters, and would help play his part in the rise and rise of a number of artists and groups. This included Morena y Clara. Their career began in earnest in 1974, partly due to the success of Los Grecas, and the rise in popularity of the new “gipsy rock” sound, which fused female flamenco with funk and progressive rock. Playing a part in the success of the new “gipsy rock” sound, were composer, arranger and pianist Felipe Campuzano, songwriter Juan Antonio Jiménez and Portuguese guitarist and producer Johnny Galvao, who nowadays, are regarded as three of the architects of this new sound. Its popularity was growing, and after Los Grecas single Te Estoy Amando Locamente sold over 500,000 copies in 1973, record companies were keen to cash-in on the success of “gipsy rock.” This was good news for Morena y Clara. The other record labels knew that CBS had the most successful “gipsy rock” band, Los Grecas on their roster, and started looking for bands that could replicate their success. A&R executives were looking for up-and-coming “gipsy rock band.” However, it was television presenter and manager Lauren Postigo, that discovered Morena y Clara who were performing one night at the Caripen restaurant. Lauren Postigo was married to Carmen Salazar La Camboria, a flamenco dancer who was now working as a producer. She and her husband would play their part on the success of Morena y Clara. Before that, Lauren Postigo secured a contract for Morena y Clara who were performing one night at the Barcelona based record company Discophon. This was home to Morena y Clara between 1974 and 1978, and where they released the fourteen songs on No Llores Más, which has just been released by Pharaway Sounds, an imprint of Guerssen Records. Now signed to Discophon, Morena y Clara, began recording the two songs that became their debut single. This was No Llores Más, with Dejé De Quererte destined for the B-Side. Both songs were penned by Juan Antonio Jiménez and Spanish guitarist Carlos Villa, with Lauren Postigo taking charge of production. The result was two songs where flamenco vocals and emotive lyrics were combined with arrangement that bore a close resemblance to progressive rock. That wasn’t only similarity. When Discophon released No Llores Más, with Dejé De Quererte on the B-Side. in 1974, critics noticed similarities with songs that had been released by CBS and Phillips. However, many of the songs released by groups like Morena y Clara and Los Chicos shared much in common sonically. This didn’t matter to Morena y Clara when No Llores Más gave No Llores Más their first hit single. Both songs also feature No Llores Más compilation. 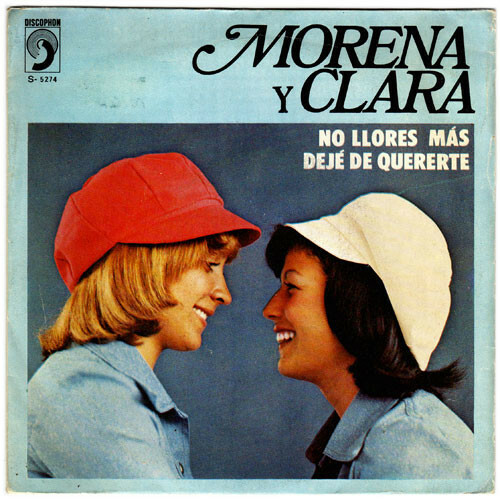 A year after the release of their debut single Morena y Clara returned with their sophomore single Morena y Clara No Me Quieres, No, which featured Serás Mi Luz on the B-Side. Both sides were penned and produced by Lauren Postigo, because Morena y Clara’s cousin Juan Antonio Jiménez was now focusing on writing songs for Los Chicos. While his songs were a loss to Morena y Clara, Lauren Postigo was a talented songwriter and producer. Proof of this was Morena y Clara’s sophomore single No Me Quieres. Although it had a similar sound to the nonaino loveless songs which had pioneered by Juan Antonio Jiménez, Morena y Clara with the help of producer gave this sound a twist. They combined it with an orchestral arrangement and Morena y Clara’s progressive funk rock sound. The result was a melodic and memorable mixture of drama and emotion that introduced Morena y Clara’s music to a new audience. Later in 1975, Morena y Clara were introduced to Ricardo Jiménez Barrull, who was the nephew of the Galician singing brothers El Luis. Ricardo Jiménez Barrull was in the process of forging a successful musical career, and later, would supply Morena y Clara with songs. 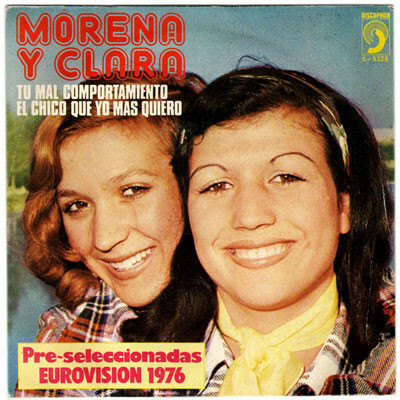 When the time came for Spain to choose their entry into the 1976 Eurovision Song Contest, Morena y Clara made it onto the shortlist with u Mal Comportamiento. However, Braulio who was a popular singer secured the most votes from the television audience, and headed to The Hague where he sang Sobran las palabras. However, he ended up a disappointing twelfth out of eighteen contestants. 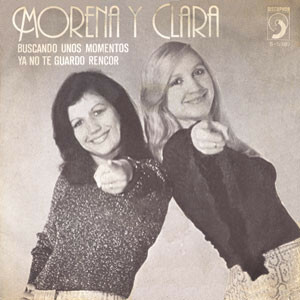 Despite not making it all the way to The Hague, Morena y Clara returned Tu Mal Comportamiento as their third single later in 1976. Just like the B-Side El Chico Que Yo Mas Quiero it was written and produced by Lauren Postigo. Tu Mal Comportamiento was one of his finest productions for Morena y Clara, and featured dancing strings and dramatic drums while Morena y Clara delivered a soulful vocal powerhouse. It was one of their finest songs, and showed just what Morena y Clara was capable of, as their popularity continued to grow. Later in 1976, Discophon released Morena y Clara’s long-awaited eponymous debut was released, with some critics comparing it to Las Grecas’ Gipsy Rock album. 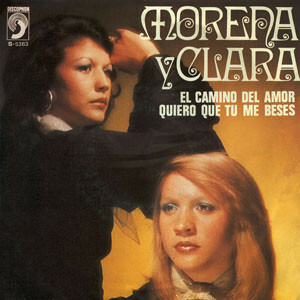 Morena y Clara featured ten tracks including four new songs. This included Sé Que Tú Me Querías and Buscando Alegría which were penned by Lauren Postigo. They were joined by Volveré A Soñar which was written by Isidro Muñoz and José Miguel. These were joined by Morena y Clara’s first three singles and their respective B-Sides. 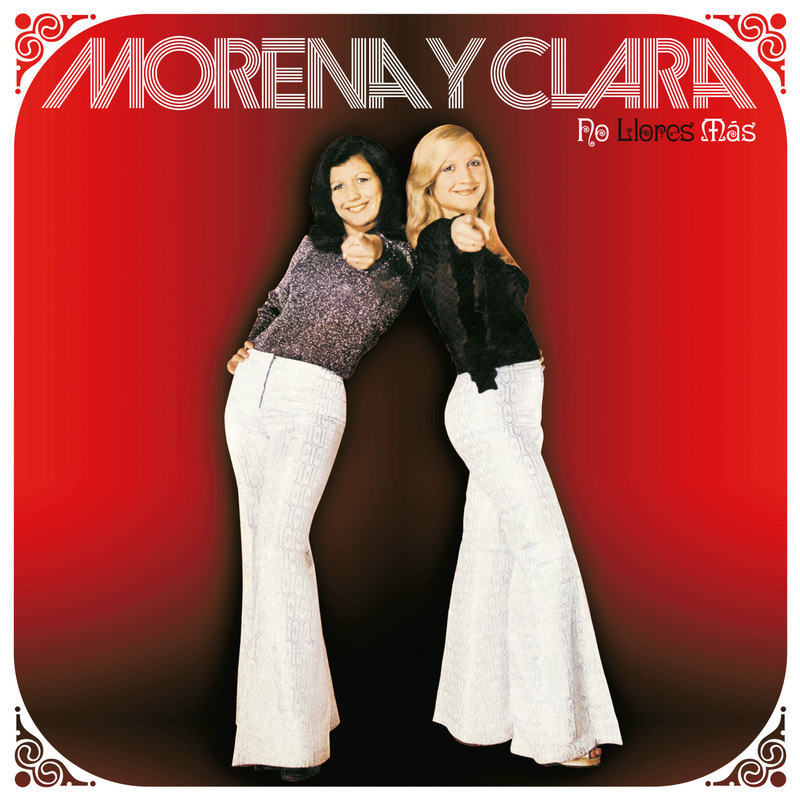 This meant that Llores Más and the B-Side Dejé De Quererte were joined by Morena y Clara’s sophomore single No Me Quieres, No, and the B-Side Serás Mi Luz on the B-Side. They were joined by Morena y Clara’s third single Tu Mal Comportamiento and its B-Side El Chico Que Yo Mas Quiero. These nine tracks feature the No Llores Más compilation, and are a reminder of the early years of the Lauren Postigo and Morena y Clara partnership which was proving a successful one. Morena y Clara’s star was in the ascendancy. By the time Morena y Clara released their eponymous sophomore album, Ricardo Jiménez Barrull was now supplying the duo with songs. Ten of his compositions featured on Morena y Clara, which were produced by Lauren Postigo. This includes Todo Pasó and Quiero Que Tú Me Beses which feature on the No Llores Más compilation. However, neither of these songs were released as singles. Morena y Clara’s fourth single was Hoy Yo Me Encuentro Sola, with Todo Pasó relegated to the B-Side. When the single was released in 1977, it failed to replicate the sales of Morena y Clara’s previous singles. Neither did the followup single El Camino Del Amor, which featured Quiero Que Tú Me Beses on the B-Side. It was released later in 1977 and confirmed that Morena y Clara’s was on the decline. This was a worrying time for Morena y Clara who up until then, had been a popular act. However, music was changing, and sadly, Morena y Clara were no long as popular. 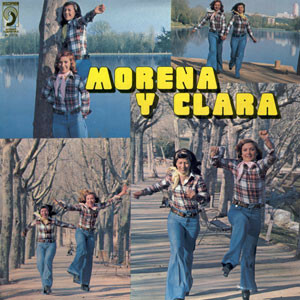 The following year, 1978, Morena Y Clara returned with their third eponymous album. It was produced by Lauren Postigo while Ricardo Jiménez Barrull wrote nine of the ten tracks. This included Aquellos Años, Eres Fiel A Tus Caprichos and Ya No Te Guardo Rencor, which feature on the recent compilation No Llores Más. Despite Morena y Clara maturing and blossoming as artists, their third album of genre-melting music failed commercially. 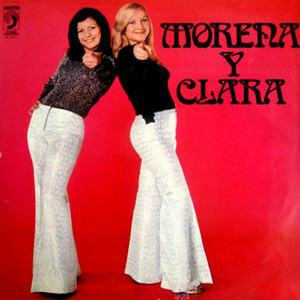 Morena Y Clara was the least successful album of the duo’s career, and sadly, that was the end of the road for them. Morena y Clara planned to record and release a fourth album for Discophon, but that never materialised. Discophon must have decided to cut their losses, and Morena y Clara were left without a label in 1978. By 1979, producer Jose Luiz de Carlos somewhat belatedly started paying attention to Morena y Clara. They sent demos to CBS which were well received, but ultimately, CBS decided not to offer Morena y Clara a recording contract. There would be no fourth album from Morena y Clara. Even after CBS declined to offer Morena y Clara a recording contract, Morena y Clara didn’t give up hope and continued to look for a label. When they failed to secure a recording contract, Morena y Clara realised their time was up after a triumvirate of carefully crafted albums. These three albums, which were released between 1976 and 1978 were all entitled Morena y Clara, featured a groundbreaking fusion of flamenco and rock that provided the backdrop for sassy, sensual lyrics. The vocals were delivered with power, passion and were full of emotion and showcased two talented sisters who could’ve and should’ve enjoyed a longer and more successful career. Sadly, by the time Morena y Clara released their sophomore album in 1977, music was changing. Disco was at the peak of its popularity, and other genres were suffering. As a result, many albums slipped under the musical radar. That was the case with Morena y Clara in 1977 and Morena y Clara in 1978. These albums are hugely underrated and best described as hidden gems, with their pioneering fusion of funk, Latin, pop, progressive rock, rhumba and rock. Proof of that is No Llores Más, which has just been released by Pharaway Sounds, an imprint of Guerssen Record and is a reminder of Morena y Clara at the peak of their powers between 1974 and 1978 when they were signed to the Barcelona based Discophon label. ← SCHLAMMPEITZIGER-DAMENBARTBLICK AUF PREGNANT HILL. Wow – I can’t believe how much they sound like Las Grecas! I never knew this band.